Originally uploaded by yasmin the storyteller. Just as 'Sepet' was selected by the 48th one, 'Gubra' has been selected by the 49th. When will Malaysia's film academicians ever catch up with Macau's film students? Last weekend, three Malaysian film-makers were invited to showcase their work at the Macau Southeast Asian film festival. The festival curator, Albert Chu, had chosen Ho Yuhang, Azharrudin and I to feature our work, and attend the screenings for, Yuhang’s 'Sanctuary', Azharrudin’s 'Amber Sexalogy', and my own 'Rabun' and 'Sepet'. Films from Thailand and Singapore were also featured. It was a humble little festival, with screenings projected on a portable screen in what was once an old ox warehouse. The festival attendees had to sit on foldable metal chairs. Truth be known, it was more of a college exhibition than a festival proper. But you know what? It was well worth our time. There were only 60 seats available, and the hall was hardly ever full. However, the reason I maintain that it was well worth our time was simply because of the quality of thinking displayed by the young audience. The students and college lecturers who came to watch our films possessed the kind of film knowledge and sensitivity which I had only previously encountered at the Italian and French festivals which I attended earlier this year and last year. While the depth of the questions thrown at me by the average Malaysian viewer concerning 'Sepet' go no further than "Did Jason die or not? ", or "How come Orked only wore baju kurung? ", or "Where got vcd seller so clever one? ", or "Why your ending so predictable? 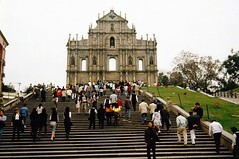 ", in little Macau, the questions were far more considered, and therefore a lot more exciting. For example, in Malaysia I am too often asked how come my hero and heroine’s parents had no problems with their relationship. Is 'Sepet' a realistic portrayal of the average Malaysian family? In Macau, they made the same observations of course, but the big difference is, they went on further to offer their take on the matter. "You seem to have an optimistic view on life. In 'Sepet', you portrayed what rarely happens, instead of what is the norm. Parents approving of their children’s inter-racial romantic affair — were you trying to suggest that love can conquer our differences?" Then someone else asked: "You ended 'Sepet' abruptly, with the death of a protagonist. Do you have personal experience of the death of a loved one that happened suddenly and without warning?" Well, of course I did! My fiance in England during university days died in an accident, and frankly, I hadn’t even thought of Michael Gordon Whitehead’s death, or the life-long effect it may have had on me, until that 19-year-old Macau boy brought it up. See what I mean? They don’t pick on the nitty-gritties, or spew up some half-baked notions of mise-en-scene or structure or semiotics, they hold up a mirror to you and make you realise things about yourself which you had long buried in the hidden recesses of your mind. But the best of them all had to be this piece of observation made by the curator himself. "In your films 'Rabun' and 'Sepet', there is this recurrent theme. Throughout both films, you consistently make comparisons between people who are so close to each other that they’re practically one, and people who are emotionally so distanced that they hardly know each other. You seem to have a major worry about mankind that’s niggling in the back of your mind. Do you think films can help people solve such difficult problems in human relationships?" "Why did you make Jason answer the phone, after showing that he had died?" "Don’t you see? At that point in the film, it didn’t matter anymore. I think she couldn’t bear to see her film end on such a hopeless note, having built up the entire plot on hope." Then she turned to me and asked: "Am I right, Miss Yasmin?" What else could I do but nod? Here was a country with no real film industry to speak of, and yet they’re blessed with a younger generation so film-savvy that it could put most of our academicians to shame. But I cannot be disheartened. Not when brilliant young filmmakers like Tan Chui Mui, 27, Ahmad Azharrudin Osman, 24, Sheikh Munasar, 22, Liew Seng Tat, 26, Deepak Kumaran Menon, 26, and Woo Ming Jin, 29, continue making films that get accepted into international film festivals like Rotterdam, Nantes and Oberhausen and keep winning prizes. There are obstacles to be overcome, of course, placed in their paths by old school bigots who cannot even see past the ethnic language our young filmmakers use in their films, never mind be able to recognise the two most precious commodities this young country of ours has to offer — TALENT and IDEAS. I am optimistic and sentimental to the point of being annoying, especially to people who think that being cynical and cold is cool. Everyday, I thank Allah for everyday things like the ability to breathe, the ability to love, the ability to laugh, and the ability to eat and drink. Check out the size of that! How the Singaporeans renewed my faith in people. He plays a crucial role in "Talentime". Nice way to end the week. The opening frame for "Talentime". Too big to be shown in full size! "Muallaf" just won a prize in Japan!